THINK YOU DON’T NEED A DOCTOR AFTER BEING HIT BY A CAR? THINK AGAIN! The longer you wait to seek medical care after the accident, the harder it will be to prove that any injuries you have were actually caused by the accident. Symptoms of a serious injury may not become apparent immediately, and you‘re putting your own health at higher risk the longer you go without seeing a doctor. 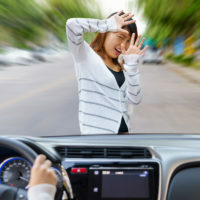 Headaches, which can develop days after the accidents, can be signals of a potentially serious problem, such as a blood clot on the brain, injury to the neck or head, or concussion. Back pain that appears after an accident could be caused by injury to the muscles, ligaments or nerves in the back or even damage to the vertebrae. Abdominal pain and swelling, areas of deep purple bruising, dizziness and fainting are signs which could indicate internal bleeding. Internal bleeding, which can remain undiscovered for hours or days, can be life-threatening and needs to be treated by trained emergency medical personnel. Numbness or loss of feeling in the arms and hands (also called whiplash associated disorder) results from damage to the neck or spinal column. Traumatic brain injury resulting from a concussion might be signaled by impaired thinking or memory, vision and hearing problems, or personality changes and depression. According to the Centers for Disease Control and Prevention, motor vehicle crashes are the third leading cause of traumatic brain injury. PTSD (Post Traumatic Stress Disorder) is common after a vehicle accident. Victims, particularly children, may have vivid and disturbing memories of the event and suffer from nightmares and flashbacks. If you have medical insurance, that is probably the first place you would turn to pay for those medical bills. It will then be up to the medical insurance company to collect reimbursement from the driver’s auto insurance. If you were working at the time of the accident, a worker’s compensation insurance carrier may be involved as well. After being hit by a vehicle, you may feel ready to get right back to life the way it was before the incident. You have no desire to spend time talking with doctors, insurance agents, and lawyers. But the truth is, rushing to “put things back together” could prove to be a costly mistake. Consider your own long term physical and financial wellbeing. Think again.